I'm sure by now you're all familiar with the latest technology where you can use an app to control lighting in your home. I for one have more technology hooked up in my house than I would have ever imagined. So to add yet another app to my phone to control lights is just not something on my agenda right now. Instead I've chosen to install some IntelliBulbs my house instead. 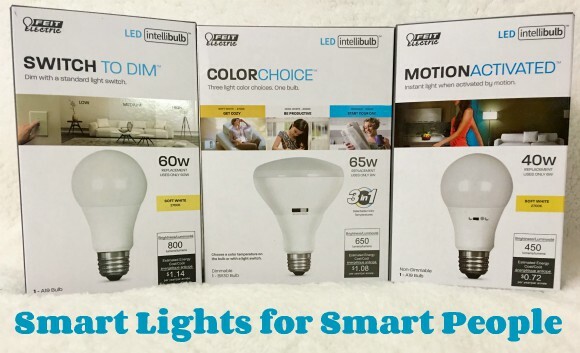 IntelliBulbs are a smart lighting solution that don’t require additional hardware or apps to use. So for me these light bulbs are a way to have that added technology benefit, yet still have something a little more "normal" plugged in at my house. I love the idea of being able to control my lights without making it overly complicated. My husband works 2nd shift so it's nice for him to be able to come home and use the Switch to Dim or ColorChoice bulb, depending on what room he is in, to help him wind down for bed. My favorite is the Motion Activated bulb because now when I walk into the laundry room with two hands full carrying dirty laundry the light automatically turns on for me. No more fumbling around trying to balance the basket and reach the light switch. I like to call them smart lights because they can do some pretty "smart" things. The motion activated light would be great to have in our garage!